About this Injection Pen:Give your next marketing promotion a shot of excitement with this customized syringe shaped pen! Click the plunger to use the pen and retract it with the tab on the side. It is filled with varying colored liquid for an authentic look but writes in black ink. Includes fluid measurements on one side. Pen is available with blue or red colored liquid. Great for medical industries! NOTE: Product comes with Prop 65 warning label when shipped to California. Label reads: "WARNING: This product may contain carcinogen, which is known to the State of California to cause cancer. For more information, go to www.P65Warnings.ca.gov. About this Dual Ended Twist Pen And Two - Piece Highlighter:This Dual Ended Highlighter is perfect for sales meetings! Mechanism: Twist-Action Pen and Two-Piece Highlighter. Ink Color/Point Style: Black ink with medium point. Highlighter matches trim color. Materials: Plastic Related Search Terms: Highlighter PenSpecial Instructions:Rush Service:The standard imprint method, 1-color/ 1-location is available. About this Plastic Dual - Tip Twist Pen - Highlighter:Combination twist-action ballpoint pen and single color chisel-tip highlighter.Material: Plastic.Special Instructions:1 Day Rush, available upon request for 1 color, 1 imprint location orders. About this The Nash Ballpoint Pen Highlighter:Dual-function.Twist-action ballpoint pen and yellow highlighter with removable cap.Material: Plastic.Special Instructions:1 Day Rush, available upon request for 1 color, 1 imprint location orders. About this The Triple - Header:3 Highlighters In One.Special Instructions:Multicolor imprint is available, Please call for service.Rush Service:Catalog Quantities Only.One Color And One Location. About this Astro Highlighter Stylus Pen:Twist ActionBallpoint Pen With Black InkChisel Tip HighlighterStylus On TopRubber Grip For Writing Comfort And ControlBlack ink, medium point.Special Instructions:Rush Service:Catalog Quantities Only.One Color And One Location. About this Gemini Pen Highlighter Combo:Retractable pen and highlighter in one! Mechanism: Plunger-Action Pen and Two-Piece Highlighter. Ink Color/Point Style: Black ink with medium point pen; Highlighter matches trim color. Materials: Plastic Related Search Terms: Highlighter PenSpecial Instructions:Rush Service:The standard imprint method, 1-color/ 1-location is available. About this Bex Highlighter Pen:Twist ActionBallpoint Pen With Black InkChisel Tip HighlighterExtra Wide Pocket ClipBlack ink, medium point.Special Instructions:Rush Service:Catalog Quantities Only.One Color And One Location. Thank you Joyce, Rachel and Timothy for your reviews. This promotional Mini Sharp Mark® helps make the perfect statement. 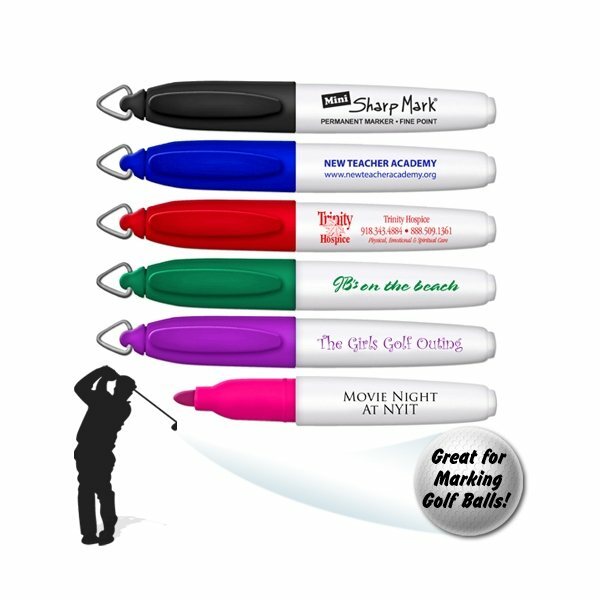 The Mini Sharp Mark® Permanent Markers With Key Ring Cap is popular with many customers because of the way it writes. Don’t let this fun marketing tool slip away! Thank you Cristy and Karina! We’re glad to read your positive reviews on our Silver Ion Wax Gel Highlighter Pen. We love reading about how well this pen writes and highlights. The Silver Ion Wax Gel Highlighter Pen is a fun pen to own because you get the best of both worlds. A pen and a highlighter all-in-one! The look of the pen makes the product even better! Wax Gel highlighter will not smear or dry out. Dual funcion Wax Gel Highlighter and pen combo. Thank you William and Carlos for your reviews. The Promotional Liqui Mark Gel Marker/Highlighter With Multi Color Choices works wonders when writing! The color comes out easily and fresh all the time. Don’t miss out on this fun and cool promotional highlighter! If you are tired of your ordinary highlighter smearing your ink jet printouts or constantly leaking through your paper, give the Promotional Liqui Mark Gel Marker a try. Just twist the highlighter to advance the gel stick and they never dry out. This customer voted "Top 100" item will highlight your brand! Highlighters are normally associated with school students, however, The Promotional Liqui Mark Gel Marker is a quick way to accentuate any important information on a business report. Help to light up your customers work by giving them The Promotional Liqui Mark Gel Marker with your company logo. The Promotional Liqui Mark Gel Marker will make a great contribution to any trade show or business expo goody bag. Because this is an office supply that gets used over and over again, your brand message will be read over and over again. The Promotional Liqui Mark Gel Marker comes in five fluorescent colors and are non-toxic. With over 250 promotional highlighters in our selection, you’ll be able to find one to highlight your company. We twist pen highlighters, ballpoint pen and highlighters, flower shaped highlighters, 5 color highlighters, eco-friendly highlighters, and more! Highlighters are great to mark important notes to keep in mind. Make your notes stand out with highlighters. With the variety of highlighters we have, you can make your notes look a bit more colorful. Promotional highlighters are great promotional items for any office environment! 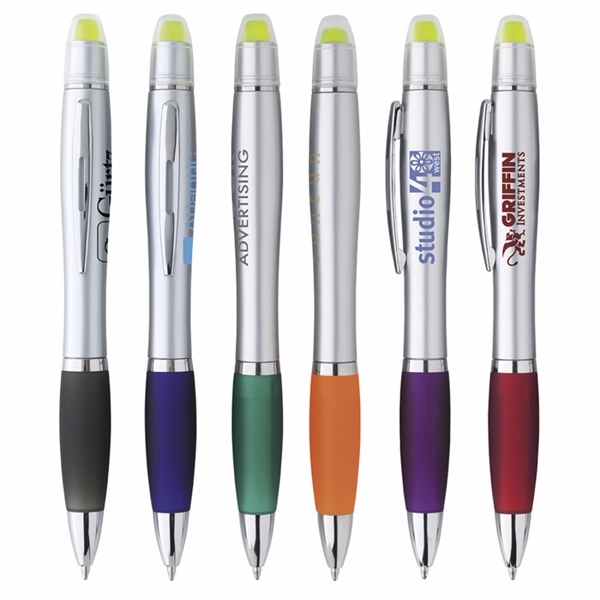 Place your logo on a promotional highlighter that will help market your company name! Look through our selection of highlighters. Shop here! Just like our customers, AnyPromo sets the bar high when it comes to making a big brand impact while getting the best bang for your buck! Click through our inventory of promotional highlighters to find what best fits your goals. These items are in-demand and won’t wind up in the trash can. 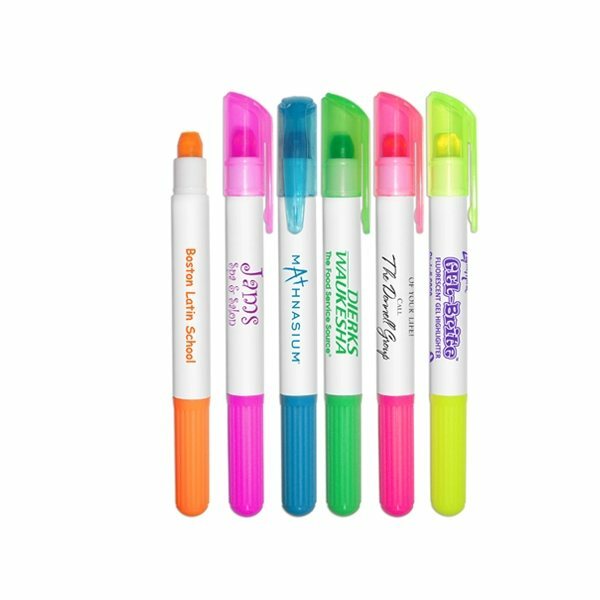 Save money and make a BIG hit with these specially priced colorful markers. Great for corrections, drawing attention to a key point, and adding pep to a storyboard, highlighters bring boring visual documents to life! Check out hot sale highlighters now at AnyPromo. Below you’ll find a most wanted list of some of our trending marker swag. Every item is available and ready for ordering through our helpful staff. Promotional highlighters are perfect for writing assignments. Mark something important with our promotional highlighters! You’ll be able to spot the important note write away! Give promotional highlighters at college fairs, office giveaways, and more! You’ll want your company logo imprinted on this fun, useful item. Our featured list of highlighters include our top sellers in this category. Don’t miss out on this convenient marketing tool that will help mark everything important.